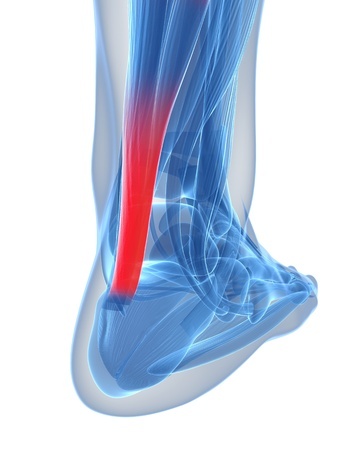 Your Achilles tendon is the largest tendon in your body, and it runs from your calf muscle to your heel bone. It comes under a great deal of pressure as you move around each day, and if it becomes inflamed or damaged, it will cause you a great deal of pain. Although Achilles tendon injuries are most common amongst athletes, they are not unusual, and can happen to anyone. Like many foot problems, Achilles tendon injuries can worsen and cause major issues if they are not treated correctly. If you think you may have Achilles Tendonitis, it is important to stop exercising and seek medical advice. You will usually be advised to rest the area completely while the injury heals, in order to avoid causing further damage. Stiffness or pain in the calf or in the heel, often worse first thing in the morning. Pain or discomfort in the back of the heel area, which may worsen if you take any form of exercise. A heel spur – a bump or bony spur that develops on the back of the heel. Swelling in the lower leg or heel that gets worse when you exercise. What Should I Do For Achilles Tendonitis? Rest and ice applications are the usual treatments for Achilles Tendonitis, and a period of time away from your normal exercise regime will usually be essential for healing. Medical professionals often suggest stretches that are specifically designed to help the tendon to heal, and a physiotherapist or podiatrist may be able to demonstrate these for you. Of course, as with most foot problems, it is very important to consider your footwear. Wearing the wrong shoes for your feet can cause big problems, and a lack of support and cushioning can lead to conditions like Achilles Tendonitis. Custom inserts may be a very helpful addition to your shoes, supporting your feet in all the right places and assisting with the healing process. In extreme cases, surgery may be offered to repair the Achilles tendon. Look After Your Feet With Comfortable Shoes! Here at Foot Solutions, our friendly staff will be happy to help you to find the best shoes for your feet. If you are experiencing foot problems, such as Tendonitis, hammer toes or plantar fasciitis, we can offer advice and information on how to treat the issue and prevent further problems from developing. Visit us at your local branch and try comfortable shoes that are designed to make your feet feel good. We have shoes for work, leisure and training, and we are delighted that our ranges don’t compromise on style! Give your feet a treat this season, with shoes that will make them feel great.